The featured report from Transparency Market Research, titled “Potassium Chloride Market - Global Industry Analysis, Size, Share, Growth, Trends and Forecast, 2013 - 2019”, offers the latest intelligence on the market. According to this report, the global potassium chloride market will expand at a 10.8% CAGR during the forecast period from 2013 to 2019. In 2012, the global potassium chloride market was worth more than US$21.6 bn and by 2019, the market is projected to be worth US$32.8 bn. In 2012, the global potassium chloride market recorded a total volume of 51 mn tons. Potassium, being one of the three major nutrients necessary for the growth of crops, is widely used in the global agriculture industry as potash fertilizer. This growing demand for potassium chloride in the fertilizer industry will drive the global potassium chloride market significantly. The growth of the global organic food industry in recent years will also propel the global potassium chloride market. With the expansion of the organic food industry around the world, the demand for potash is rising. On the basis of application, the global potassium chloride market is divided into industrial, pharmaceuticals, fertilizers, and others such as food products and feed. 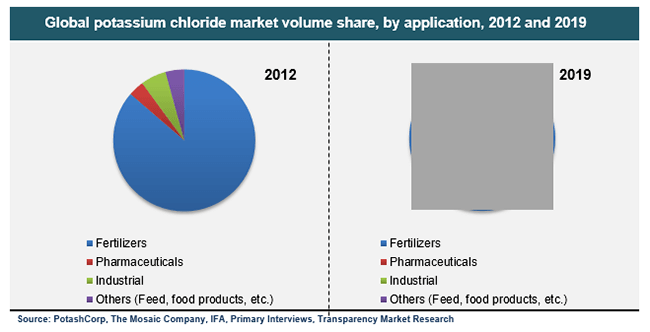 The fertilizers segment dominated the global potassium chloride market in 2012. A growing number of industries use potash fertilizers. Fertilizers are also expected to witness the fastest growth in the global potassium chloride market, with a CAGR of 5.1% expected during the forecasting horizon. At present, Germany is one of the major producers of industrial-grade potash, while the U.S. is the largest consumer of potash. In the U.S., potash is increasingly being used for water-related applications. By geography, the global potassium chloride market is segmented into Asia Pacific, Europe, North America, and Rest of the World (RoW). In 2012, Asia Pacific dominated the global potassium chloride market and the regional market was worth over US$9.5 bn. The growing number of agricultural activities in Asia Pacific is fuelling this regional market. In addition to this, the Asia Pacific sector will experience the fastest growth in the global potassium chloride market due to the growing focus on agricultural productivity. The Rest of the World segment emerged as the second largest regional market in the global potassium chloride market. Emerging nations such as Brazil have displayed an accelerating demand for KCl to be used in the feedstock of biofuels. This trend is projected to boost the demand for potash fertilizers in Latin America, in turn fuelling the Rest of the World potassium chloride market. Although the global potassium chloride market is expected to witness healthy growth in the coming few years, there are a number of factors that will challenge this market. One of the major causes for concern for the global potassium chloride market is the rising health issues related to the use of chemical fertilizers. In addition to this, the global potassium chloride market will also be suppressed by the fluctuating prices of potassium chloride. Nevertheless, the players in the global potassium chloride market will benefit from the opportunity of the rising use of biofertilizers across the globe. Some of the key players operating in the global potassium chloride market are Sinofert, Uralkali, Israel Chemicals, and Agrium.